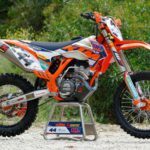 Knowing how to clean a dirt bike chain is one of the basics of maintaining your dirt bike. It’s a job that only takes a few minutes, but is essential to prolonging the life of your chain and sprockets. They’re not cheap, so a bit of time spent cleaning and lubricating can save you some money in the long run. There two ways to clean your chain. Either with the chain on the bike or by removing the chain from the bike. The majority of the time you’ll get away with the first option. If you’ve been riding in deep mud or clay, and the chain is literally caked with mud, there’s no way you’re going to be able properly clean it on the bike, you’ll have to remove it. 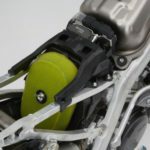 Put your bike on the stand with the rear wheel off the ground. The easiest and most effective way is to use a product specifically designed for cleaning dirt bike chains. Motorex Chain Clean is a highly recommended cleaner, used by most of the professional riders. 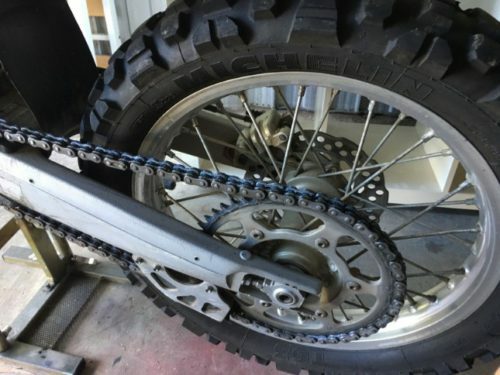 Most chains these days are ‘O’ ring chains, and the Motorex cleaner is designed for this type of chain. Just spray it on the outside and inside of the chain as you rotate the rear wheel for at least one full rotation of the chain. Leave it a few minutes to soak in then use a rag to wipe off as much dirt as you can. It may be necessary to use a stiff bristled brush to get at hard to reach places. Take care not to push dirt into the chain. It is explained perfectly in this video by Lyndon Poskitt. Lyndon races in the toughest events all over the world, like the Dakar Rally and Erzberg Rodeo. He knows. How Often Should You Clean Your Chain? Every time you ride if you’re doing a one day ride. 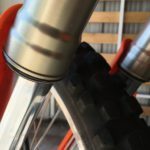 If you’re on an adventure ride or doing a multi-day ride, you might not get a chance, or have the facilities to clean it, so at the very minimum lubricate it at the end of every day. If you are at home and have more time, it’s always good to remove the chain and submerge it in a container of kerosene and give it a good scrub. Kerosene is good for dissolving the old chain lube and is perfectly fine to use if you don’t have a proper chain cleaner. Avoid using petrol or carb cleaner – especially on an ‘O’ring chain. It tends to swell the ‘O’rings. Kerosene and WD40 have a negligible effect on the ‘O’rings. Then rinse off the dirt and mud with water. A hose is Okay, but not a pressure washer. Kerosene doesn’t dissolve dirt, this is where you need water, preferably hot. ‘O’ ring or ‘X’ ring chains have the lubricant sealed inside them, so it’s best not to use a wire brush on them to avoid damaging the ‘O rings. Use an old toothbrush or any type of stiff bristled brush. You can even buy a specialized chain cleaning brush on Amazon for a few bucks. Makes a dirty job a little bit easier. It’s best to use a pair of pliers to remove the clip. Some riders use a screwdriver, but I don’t recommend it. It tends to damage the ‘C’ clip on the master link if you’re not careful. Simply place one side of the pliers on the pin nearest the clip opening, and the other side of the pliers on the opening of the clip. Squeeze together and the clip will slide off. To put the clip back on, do the same, but position the pliers on the pin at the closed end, and on the closed end of the clip and squeeze to slide it on. When putting the clip back on – the opening faces backward in the direction of rotation. Put it on the wrong way, and you’re liable to have it come off and drop the chain while you’re riding. Aside from overrevving your bike, I’ve seen riders have the chain whip them in the back of the leg, it’s very painful. With the bike on the stand, rotate the back wheel and spray the lube on the inside of the chain, and then on the outside for at least one full rotation of the chain. It’s important to lubricate the rollers in the center of the chain that run on the sprockets. Then spay a little on the ‘O’ rings to stop them drying out. It’s not necessary to spray the side links of the chain. 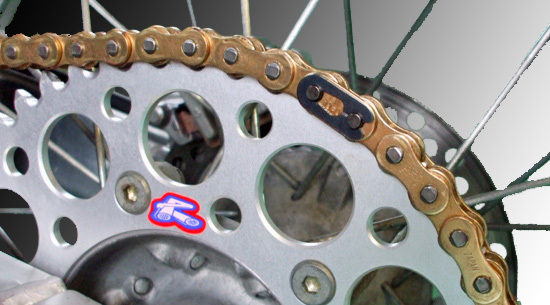 Try not to over lubricate the chain because it will just flick off and attract dirt. The Motorex Offroad chain care kit is ideal because it comes with a mini chain lube that can easily be carried with you in your hydration pack or bum bag. Its compact size makes it perfect for adventure riders on trips of a few days. You’ll get about 5 or 6 lubes out of the can. It can also be refilled from the large can. Simply remove the nozzles and place the two cans together. Clean your chain after every ride. 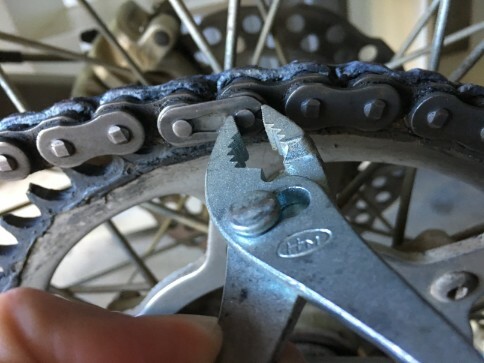 Replace your chain when you start noticing the sprocket teeth wear, like starting to hook over. A quick test is to pull the chain away from the rear sprocket. If it comes away more than a few millimeters, it’s worn. Alternatively, you can remove it and measure its length. Your service manual will tell you when it has stretched too much. 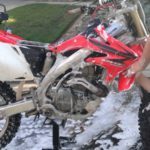 What do you use to clean your dirt bike chain? Is there a product or a method you can recommend?